1) This article was for the first time presented at the FIG/GSDI Conference in Cairo, Egypt, 16-21 April 2005. Key words: Land administration, land market, cadastre. Land surveyors are experts in designing, building and managing the spatial component of our land administration systems (LAS). They are experienced in creating, describing and defining land parcels and the associated rights and restrictions. One of the primary reasons that society requires these skills is to support an efficient and effective land market, which will promote economic development where rights in land can be bought, sold, mortgaged and leased. However as professionals, along with land administration officials and associated legal professionals, we assume that we understand land markets and that we have developed appropriate professional skills to serve the needs of those markets. Unfortunately this is often not the case. There is little documentation on how to design and build a land market or on the development and growth of land markets. It is ironic that surveyors pride themselves on working from the “whole to the part”, yet in the case of land markets there is little effort given to designing the land markets and then designing the land administration system and supporting spatial skills to support them. Our current cadastral skills are appropriate for simple land markets where the focus is traditional land development and simple land trading, however land markets have evolved dramatically in the last 50 years and have become very complex, with the major wealth creation mechanism focused on the trading of complex commodities. As with simple commodities such as land parcels, all commodities require quantification and precise definition (de Soto, 2000). While land surveyors have not embraced the administration of complex commodities to a significant degree (although I wish to acknowledge and applaud those that have), these modern complex land markets offer many opportunities for surveyors if they are prepared to capitalize on their traditional measurement and land management skills. This paper shows that the growth of markets in complex commodities is a logical evolution of our humankind to land relationship and the evolving cadastral and land administration systems. The paper concludes that the changing humankind to land relationships, the need to pursue sustainable development and the increasing need to administer complex commodities offer new opportunities for land surveyors. 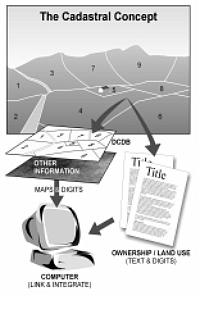 Figure 1: The Cadastral Concept (FIG, 1005) The cadastral concept shown in Figure 1 (FIG, 1995) is simple and clearly shows the textual and spatial components that are the focus of land surveyors and land registry officials. However while the cadastral concept is simple, implementation is difficult and complex. While this model is still a useful depiction of a cadastre, it does not show the evolving and complex rights, restrictions and responsibilities that a modern society demands in order to deliver sustainable development objectives. To understand this evolution it is worth considering the changing humankind to land relationship over the centuries. Even though Figure 2 depicts a western example of this evolving relationship, a similar evolution can be plotted for all societies. 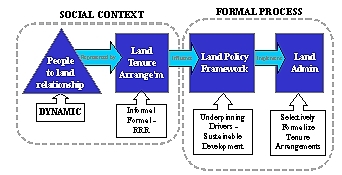 In this diagram the evolution from feudal tenures, to individual ownership, the growth of land markets driven by the Industrial Revolution and the impact of a greater consciousness about managing land with land use planning being a key outcome, and in recent times the environmental dimension and more recently the social dimension in land, are highlighted (Ting and Williamson, 1999a). Historically an economic paradigm drove land markets however this has now been significantly tempered by an environmental and more recently a social paradigm. Simply the humankind to land relationship in any society is not stable but is continually evolving. In turn most civilisations have developed a land administration response to this evolving humankind to land relationship. 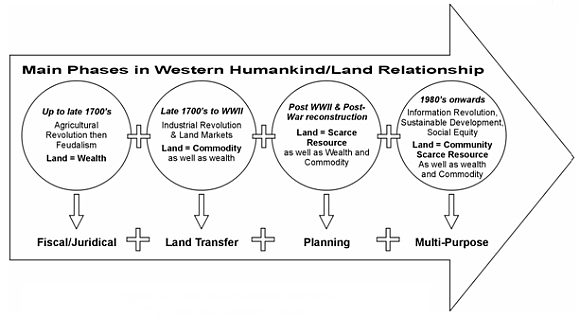 Figure 3 depicts the evolution of these land administration responses over the last 300 years or so in a western context. The original focus on land taxation expanded to include the support for land markets, then land use planning and over the last decade or so has expanded to provide a multi-purpose role to support sustainable development objectives (Ting and Williamson, 1999b). Current land administration systems were developed since the middle 19th century to define simple land commodities and to support simple trading patterns (buying, selling, leasing and mortgaging), particularly by providing a remarkably secure parcel titling system, an easy and relatively cheap conveyancing system, and reliable parcel definition through attainable surveying standards. Arguably, countries like Australia and their European counterparts have led the world in adapting their LAS to support land parcel marketing. Major innovations of the Torrens system of land registration and strata titles for example are copied in many other countries. However, because of the pace of change, the capacity of LAS to meet market needs has reduced. The land market of, say, 1940 is unrecognisable in today’s modern market. After WW II new trading opportunities and new products were invented. Vertical villages, time shares, mortgage backed certificates used in the secondary mortgage market, insurance based products (including deposit bonds), land information, property and unit trusts and many more commodities now offer investment and participation opportunities to millions either directly or through investment and superannuation schemes. The controls and restrictions over land have become multi-purpose, and aim at ensuring safety standards, durable building structures, adequate service provision, business standards, social and land use planning, and sustainable development. The replication of land related systems in resource and water contexts is demanding new flexibilities in our approaches to administration (see Wallace and Williamson, 2004 for more details). capitalize on opportunities available from digital and web technologies. The combination of new management styles, computerization of activities, creation of databanks containing a wealth of land information, and improved interoperability of valuation, planning, address, spatial and registration information allowed much more flexibility. However, Australian LAS remain creatures of their history of state and territory formation. They do not service national level trading and are especially inept in servicing trading in new commodities. The result is that modern societies, which are responding to the needs of sustainable development, are now required to administer a complex system of overlapping rights, restrictions and responsibilities relating to land. Modern societies are also now realising that there are many rights, restrictions and responsibilities relating to land, which exist but have not been formalised by governments for various policy or political reasons. This does not mean these rights don’t exist but that they simply have not been formalised. A good example is the recognition of indigenous aboriginal rights in land in Australia in the 1980s. Prior to the Mabo and Wik decisions and the resulting legislation in Australia, indigenous rights did not formally exist. However this does not mean these rights did not exist, albeit informally. This process of formalising tenure and rights, restrictions and responsibilities in land is depicted in Figure 4. An understanding of both formal and informal rights is important as we move to develop land administration systems that are sensitive to sustainable development objectives. 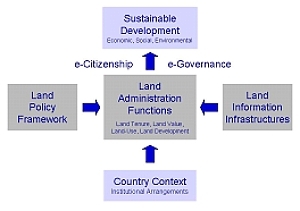 A model for a modern land administration system (Enemark et al, 2004) that draws on the above principles is shown in Figure 5. At the same time land markets have also evolved from systems for simple land trading to trading complex commodities such as mortgage backed certificates and water rights. 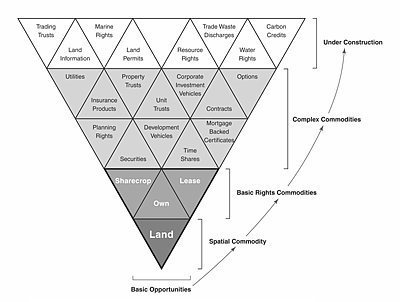 Our understanding of the evolution of land markets is limited but an appreciation is necessary if we are going to maximise the potential of trading in complex commodities by developing appropriate land administration systems that can support this trading (Wallace and Williamson, 2004). 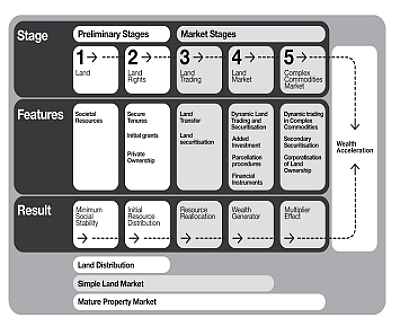 Figure 6 shows the various stages in the evolution of land markets from simple land trading to markets in complex commodities. The growth of a complex commodities market showing examples of complex commodities is presented diagrammatically in Figure 7. This brief review of the evolution of land administration systems and land markets shows that the traditional concept of cadastral parcels representing the built environmental landscape is being replaced by a complex arrangement over-lapping tenures reflecting a wide range of rights, restrictions and responsibilities and that a new range of complex commodities building on this trend have emerged. To a large extent these developments have been driven by the desire of societies to better meet sustainable development objectives. There is no reason to believe that this trend will not continue as all societies better appreciate the need to manage the environment for future generations. Many surveyors are highly skilled in accommodating environmental considerations into land developments. But how many surveyors have moved outside their comfort zone of focusing on the boundaries of individual cadastral parcels? While future markets of complex commodities will continue to rely on the underlying cadastre and land administration system, how many surveyors will embrace the definition and management of complex commodities that don’t rely on the traditional cadastral boundaries? In this paper I have attempted to show that the humankind to land relationship is dynamic with the result that the land administration response to managing this relationship is also dynamic and is continually evolving. A central objective of the resulting land administration systems is to serve efficient and effective land markets. Because of sustainable development and technology drivers, modern land markets now trade in complex commodities, however our current land administration systems and the majority of the skills of land surveyors are focused on the more traditional processes supporting simple land trading. I believe the growth in complex commodities offers many opportunities for surveyors if they can capitalize on their traditional measurement and land management skills. I don’t have all the answers or a road map for surveyors to play a greater role in the management of complex commodities markets, although I do believe it offers many opportunities and is a logical extension of their traditional measurement and land management skills. The challenge is not only to surveyors but also land registry, land administration and land information officials to design and build modern land administration systems that will better support the creation, administration and trading of complex commodities. Unfortunately without these systems modern economies will have difficulty meeting sustainable development objectives and achieving their economic potential. I wish to gratefully acknowledge the assistance of my colleagues in the Centre for Spatial Data Infrastructures and Land Administration, Department of Geomatics, University of Melbourne in the preparation of the article, and particularly the assistance and ideas from my colleague Ms Jude Wallace. I also wish to acknowledge that an earlier version of this paper was presented at the 4th Trans Tasman Surveyors Conference, Auckland , New Zealand, 13-16 October, 2004. Dalrymple, K., Wallace, J. and Williamson, I.P. 2004 Rural Land Arrangements to Address South East Asian Policy Development. Submitted to the International Planning and Development Review. Enemark, S., Wallace, J. and Williamson, I.P. 2004. Land administration arrangements. Submitted to the Spatial Sciences Journal, Spatial Sciences Institute, Australia. FIG, 1995. The FIG Statement on the Cadastre. International Federation of Surveyors, FIG Publication No 11. Ting, L., Williamson, I.P. Grant, D. and Parker, J. 1999a. Understanding the Evolution of Land Administration Systems in Some Common Law Countries. The Survey Review, Vol. 35, No. 272, 83-102. SurvReview_.pdf Accessed 8th August, 2004. Ting, L. and Williamson, I.P. 1999b. Cadastral trends: A synthesis. The Australian Surveyor, Vol. 4, No. 1, 46-54. Wallace, J. and Williamson, I.P. 2004. Building land markets. Accepted for publication in the Journal of Land Use Policy. Ian Williamson is Head, Department of Geomatics, University of Melbourne, Australia, where he is Professor in Surveying and Land Information, and Director of the Centre for Spatial Data Infrastructures and Land Administration. He is Chair, PCGIAP-Working Group 3 (Cadastre). He was Chairman of Commission 7 (Cadastre and Land Management) of the International Federation of Surveyors (FIG) 1994-98 and Director, United Nations Liaison 1998-2002. His teaching and research interests are concerned with designing, building and managing land administration, cadastral, and land and geographic information systems in both developed and developing countries.